Shocking absolutely nobody, Christopher Lambert Raiden, the silver-haired thunder god, is one of Mortal Kombat X’s violent roster. The hat-loving deity has three fighting styles, allowing players to switch between ending combos with devastating electric blasts, teleporting around and trolling enemies, and planting bombs. The sneaky bugger. Check out the old fella in action below. 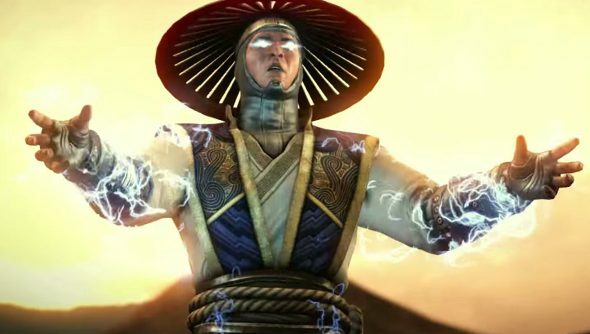 Co-creator Ed Boon teased more Mortal Kombat details at EVO 2014. He said that DLC characters are once again being planned. Just as with the previous Mortal Kombat, at least one combatant will be drawn from another franchise. Dreamy Freddy Krueger was one such DLC character, and comes bundled with the Komplete Edition. Maybe we’ll see a superhero or villains from the DC Universe make an appearance, since Scorpion appeared in Injustice: Gods Among Us. Who would you like to see inexplicably appear in the next Mortal Kombat?